There are few people, however busy their lives, unable to remember the last meal that they consumed. But Prahlad Jani is one of them. And the reason is that the last morsel of food that he says passed his lips did so in the early years of World War II. During the 70-odd years since, Mr Jani says he has eaten not so much as a single grain of rice nor consumed a drop of water. And while such an extended gap between meals might be expected to have a fatal impact on the activities of one so deprived, this octogenarian says he’s never felt better. Tests: 83-year-old Prahlad Jani has twice attended hospital to be watched round the clock by eminent doctors. No food? No water? Superhuman strength? One straitjacket (size zero) for Mr Jani, please. It is, of course, more than tempting to dismiss this Hindu holy man and his claims as the stuff of absolute nonsense. Medical science tells us that human beings rarely survive more than a week without water, and a couple of months at most without food. To even suggest otherwise is ridiculous, and also potentially dangerous. Practitioners of extreme starvation diets can cause serious damage to their bodies, leading to death. And yet, despite all that is known, there is a growing bandwagon that says Mr Jani and his incredible claims should not be dismissed entirely out of hand. 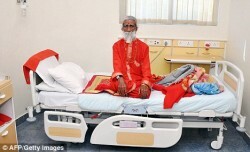 On Thursday afternoon, he emerged from hospital in the Indian state of Gujarat, where he had spent 15 days. He was monitored around the clock and, according to the medics who oversaw him, consumed no food and no water whatsoever. No human should be able to survive such conditions unscathed — the lack of water alone should have killed him. But Mr Jani apparently suffered absolutely no ill-effects at all. Attending a press conference at the Sterling Hospital in Ahmedabad, he said: ‘I am fit and strong today and even the doctors agree. They ran every test possible for 15 days and proved that I do not need food to keep me strong. So what is the explanation for his ability to endure such privations? No one knows for sure. But over the next three months, the medics will attempt to come up with some answers as they study the results of a battery of tests. Military scientists drawn from India’s Defence Research and Development Organisation believe that Mr Jani could hold the key to understanding how humans can be taught to survive for long periods without sustenance. ‘It is possible that it will be able to help save human lives during natural disasters, high altitude, sea journeys and other natural and human extremities,’ said a spokesman for the team. verified. The same goes for much of his early history. According to his version of events — and there is no other — Mr Jani left his home in Rajasthan at the age of seven, and went to live in the jungle. When he reached the age of 11, he underwent a religious experience during which he became a follower of the Hindu goddess Amba. In her honour, he chose to dress as a female devotee, wearing a red sari-like garment, nose-ring, bangles and crimson flowers in his shoulder-length hair. In return, Mr Jani believes that the goddess has sustained him ever since by feeding him with a lifegiving, invisible ‘elixir’, which has supposedly given him the strength to continue without food or water. For at least the past 40 years, Mr Jani has been living, hermit-like, in a cave in the jungles close to the Gujarati temple of Ambaji. He rises at 4am, spending most of the day meditating. While well-known locally, for many years Mr Jani was no more famous than the millions of other Hindu holy men — sadhus or yogi as they are known — in India. Mystical figures, these individuals renounce normal life for one on the margins of society, focusing every waking minute on the spiritual. They often assume austere or extreme practices — standing on one leg or refusing to talk for years on end. 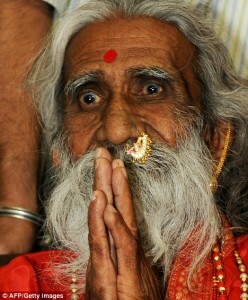 Like Mr Jani, many sadhus regularly undergo lengthy periods of fasting. But the claim that his fast had endured for decades caught the public imagination and first propelled him into the limelight. Challenged to prove that he could survive without food or water, in 2003 he underwent his first hospital investigations. Then, as now, he was placed under the care of Dr Sudhir Shah, a consultant neurologist from Ahmedabad who specialises in studying people with seemingly ‘supernatural’ powers. Doctors had prepared a special glass-walled room equipped with CCTV cameras to monitor Mr Jani for ten days. The toilet was sealed to test his claim that he had no need to urinate or defecate. The only fluid allowed was a small amount of water, to use as mouthwash. This was collected and measured in a beaker when he spat it out, to make sure that none had been drunk. Scans revealed some urine accumulation in his bladder, but this seemed to be re-absorbed by the body because it was never passed. In every other respect, clinically, Mr Jani was found to be perfectly normal. While the results secured him an international following, they failed to offer any concrete answers. As a result, Dr Shah and the military team decided to repeat the experiment this year. So, on April 22, Mr Jani re-entered the hospital for 15 days of tests. They ended on Thursday afternoon with doctors admitting that they were baffled by what they had seen. Presenting their preliminary findings, Dr Shah was joined by biologist Dr Ilavashagn, director of the Defence Institute of Physiology and Allied Sciences (DIPAS), a heavily-funded department of the Defence Research and Development Organisation. The doctors announced that despite apparently living on thin air for two weeks, the holy man was more healthy than someone half his age. Blood tests, hormone profiles, MRIs and angiographs (imaging tests of the blood vessels) all pointed to the conclusion that Mr Jani had not needed to eat, drink or use the toilet once. There will be many who maintain that the latest tests prove nothing — and that Mr Jani’s survival is down to nothing more mysterious than trickery. That’s the view held by the Indian Rationalist Association, an organisation which publicly campaigns against superstition and spiritual fraudsters. It has attacked the Indian Ministry of Defence for even agreeing to take part in the tests, accusing them of being ‘taken in by the absurd claims of a village fraud’. Sanal Edamaruku, the association’s secretary general, told the Mail: ‘I asked to be allowed to send an independent team to survey the room where this test is taking place, but I was repeatedly turned down. ‘It is ridiculous to ask people to believe that any man can go 15 days, let alone 70 years, without food or water. ‘Dr Shah has been in charge of three similar investigations over the past ten years, and he has never allowed independent verification. ‘In 2000, he was asking for funds to investigate a man he claimed got his energy from the sun, just like plants do. Mr Edamaruku is convinced that Mr Jani must have had access to food and water at the hospital, and does not believe that he was kept under strict supervision around the clock. He says that whenever the Rationalist Association has investigated individuals making similar claims, all have been exposed as frauds. In 1999, they investigated a woman who claimed that she was the reincarnation of another Hindu goddess. For five years, she had remained alone in a small closet where it was claimed she had not eaten nor passed any urine or faeces. In co-operation with the police, investigators from the association searched the room, finding a toilet hidden behind a shelf and a disguised hole through which she received food. Blood tests revealed the presence of glucose, indicating the intake of food. To further prove the case, a gas was released into the room that made the woman vomit. The contents of her stomach were found to include pieces of recently-eaten chapatti and potatoes. Mr Edamaruku is concerned that by publicising the activities of individuals such as Mr Jani, others will be encouraged to copy. ‘The Hindu religion is a belief system that’s all about magical thinking, about great things happening that are not understandable to the ordinary person,’ he explained. ‘These claims are very dangerous, because people try to follow these holy men and can end up hurting themselves. ‘In any other religion there’s a priest who requires a lot of training and there’s a structure which means people can’t just make up their qualifications. Perhaps he’s right. Doesn’t logic and common sense dictate that Prahlad Jani must be tricking the world somehow? And yet, there’s a part of all of us that would love to believe such a human ‘miracle’ could be true. After all, isn’t a consultant neurologist staking his reputation on these tests being entirely watertight? We may never know the truth, but until he is exposed as a fraud, perhaps we should enjoy suspending our disbelief and give Mr Jani the benefit of the doubt.